New officers for 2019 were elected at the October 2018 Annual Celebration & Mtg. and will asume their duties January 1st, 2019. 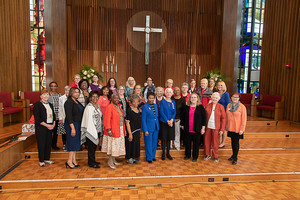 2019 NTC UMW District Officers. UMW Officer Training from National UMW NTC UMW 2018 Mission Team Friends: Workshops form UMW LDD 2017 (Leadership Development Days) are now online for your viewing and learning pleasure. Before you can access the course content in Bridge (the online platform), you need to advise UMW that you are interested in viewing the material. Just email Alana Walls @ UMW: awalls@unitedmethodistwomen.org, and she will send you an email with next steps. You will need to set up a log-in/username and password. Past officers (2017) were elected at the October 2016 Annual Celebration & Mtg. asumed their duties January 1st, 2017. A list of 2017 Officers is in pdf form and available as a pdf by clicking here.